Our Certified Arborists and Tree Care Technicians are committed to providing customers with the highest quality of service, and upholding OSHA-compliant safety standards. Healthy and properly maintained trees can add considerable value to your property. Bob Ray Co., Inc., Certified Arborists and Tree Care technicians are trained based on the latest industry standards and utilize state-of-the-art equipment and techniques to complete every project safely and professionally. Our Certified Arborists are knowledgeable and highly trained in the ANSI Standards to improve your trees’ appearances and add value to your property or municipality. Safety and customer satisfaction are our top priorities. The use of cranes and bucket trucks help our tree crews complete jobs in a safer and more timely fashion, with little to no impact to your property or its surroundings. Our goal is to increase a tree’s longevity and maintain its overall health. Tree care is a combination of proper pruning, assessment and, when necessary, removal. The decision to remove most often is due to tree failure, storm-related damage, or a tree’s state of decline. The Bob Ray Co., Inc., is committed to providing the highest quality of service for all your tree care needs whether it be pruning, maintaining, or removal for residential and commercial customers. A healthy well-maintained tree can add considerable value as well as safety for a property and community. Proper tree pruning starts with hiring a company that has experience and knowledge of trees’ needs, as well as an understanding of the customers objectives. Our staff of Certified Arborists and technicians will gladly help with your pruning needs, including: canopy reconstruction, removal of dead or broken branches, clearing limbs back or away from structures, or elevating low hanging limbs up and off your driveway. Once a tree is cut down and removed, the question very quickly becomes, “what to do with the stump?” After a tree is removed the stump may remain or be ground out. Sometimes the stump is in an area that wouldn’t benefit from its removal. When a stump is a trip hazard, mowing obstruction, or distraction/eye sore, various forms of grinding may be warranted. Depending on your need, we can grind stumps out completely for replanting or to a lesser depth to allow grass to grow. 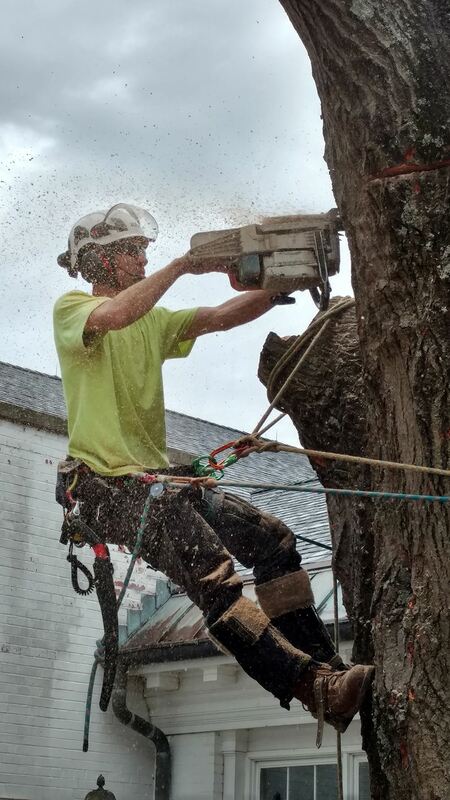 While most tree services do not offer removal of grindings, Bob Ray Co., Inc., does. We also offer backfilling, and applying grass seed and straw. Our stump grinding machine can fit through a 36” gate opening. Despite our love of trees, their removal is sometimes required. This may be due to a variety of factors. Trees can outgrow their space or become structurally unsound. An arborist can help decide if a tree should be removed. Utilizing high-tech equipment, we strive to impact the environment as little as possible. Cabling is done to provide supplemental support to two or more co-dominant limbs in order to limit additional splitting and lengthen the life and stability of the tree. This is accomplished by using high-tensile strength cables and hardware that meets industry standards. Cables are only meant to add supplemental support. During severe weather you can count on the Bob Ray Co., Inc., for your emergency tree care services. With our fleet of specialized equipment and fully trained and safety focused staff, you can rest assured your property will be made safe. Have a Tree Emergency? Click below to view our Emergency contact info to point you in the right direction. Bob Ray Co., Inc., provides employees a safe and drug-free working environment and is OSHA-compliant. We offer our customers a level of professionalism and integrity that they have come to rely upon for nearly 60 years of operation in the Kentuckiana area.